Breaking: Frankie Edgar vs. Korean Zombie is “locked in” for Nov. 10 UFC Fight Night main event in Denver, per Dana White. Also per Dana White, freaking Cowboy Cerrone vs. Mike Perry (!!!!!!) is “good to go” for UFC Fight Night on Nov. 10 in Denver. Chris Taylor of BJPenn.com first reported the Edgar vs. Jung bout. Both fights contain a pair of big fan favorites and the thought of these fights occurring on the same card will surely give fight fans something to look forward to this autumn. The featherweight bout features two highly regarded names in the UFC, the legendary Frankie “The Answer” Edgar and former title challenger The Korean Zombie, who made his return to action last year in a KO victory over Dennis Bermudez following a four-year absence from competition. Edgar is also coming off of a victory, picking up a unanimous decision win over Cub Swanson at UFC Fight Night: Barboza vs. Lee. Early reports are that this bout will serve as the headliner for the card. 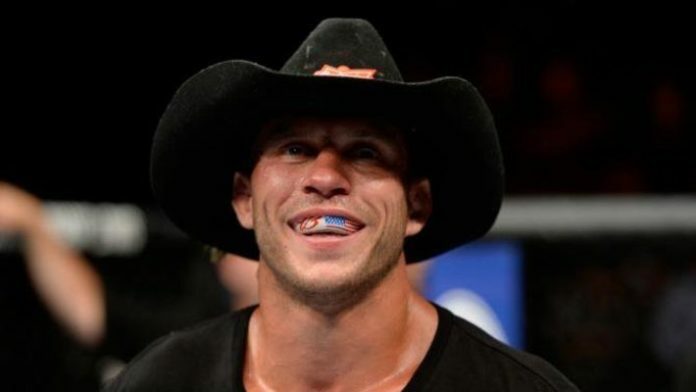 In the welterweight scrap, Donald Cerrone will be looking to bounce back from a loss to Leon Edwards at UFC Fight Night 132, but more than anything, the Cowboy will appear in his hometown for this bout an even bigger fan favorite as usual for the primary purpose of fighting. And his counterpart, Mike Perry, shares the legend’s zest for throwing down, so when these two passionate gladiators meet in the middle of the Octagon, fireworks are all but guaranteed. Mike Perry just picked up a win over Paul Felder at UFC 226 via split decision, and is wasting no time in getting right back in the ruckus. Which fight are you more excited for? !